I have been thinking about the chicken wings from Little Star Pizza. The more I thought about the place, the more I thought that it wasn't that bad... maybe it's worth the price... maybe... Friday night we decided to grab something quick and fast back to the apt to eat. I looked up reviews on Tommaso's and debated between trying something new or giving Little Star Pizza another go. Sadly, I made the mistake to give it another try. It's only because I really wanted the chicken wings and the yummy blue cheese dressing. They were very busy even late at night, we called in the order for take out. I think last time we arrived just as it came out and it was piping hot, this time it was already cold. Even though they stored the items to preserve the heat, but it failed to work. I think because we ordered the thin crust, it lacked the density to retain the heat. We didn't eat the Spicy Chicken Wings until we got home and it wasn't nearly as tasty as the first time I had it. The portions seemed smaller and overdone. It was a great disappointment! =*( I was really looking forward to it. We debated about the age-old argument that things never taste as good as the first time you have it. I think that was partly true but they missed the mark in how it should be prepared. As for the pizza we got the Pesto Chicken Thin Crust Specialty Pizza. 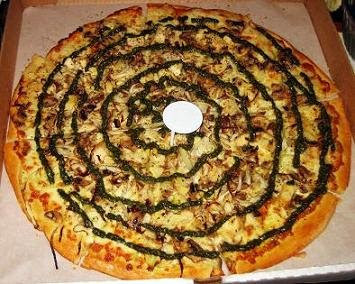 It's pesto, roasted chicken, mushrooms, and onions atop a thin crust. This was such a let down! We were both sooooo DISAPPOINTED. The crust was not anything special or tasty. They were lacking any flavor, I couldn't really taste the Pesto at all. I really regret not going with their deep dish, which actually packs a wallop. We still have the pizza sitting in the fridge... boooo! I actually really like thin crust too, but this place just didn't measure up. If you go, I would recommend you to stick with the deep dish and the chicken wings would be your luck.